- Publisher Edwards, often remembered for his sermon "Sinners in the Hands of an Angry God," is revealed here as a man with a heart for God's glory above all things. To help himself pursue that goal, he composed a set of resolutions to guide his conduct in all areas, from his battle against sin to his use of time. In Edwards' singleminded pursuit of God, Dr. Lawson sees an unparalleled example for modern Christians. Book jacket. 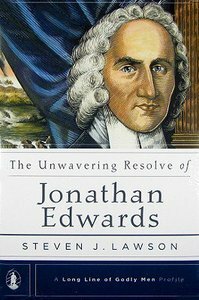 About "Unwavering Resolve of Jonathan Edwards (Long Line Of Godly Men Series)"
Edwards, often remembered for his sermon "Sinners in the Hands of an Angry God," is revealed here as a man with a heart for God's glory above all things. To help himself pursue that goal, he composed a set of resolutions to guide his conduct in all areas, from his battle against sin to his use of time. In Edwards' singleminded pursuit of God, Dr. Lawson sees an unparalleled example for modern Christians. Book jacket. Understanding the doctrines of grace will give you a clearer picture of God?s sovereignty. From the lawgiver Moses to the apostle John, and from the early church fathers to modern defenders of the faith, there has marched onto the stage of human history a long line of godly men, a triumphant parade of spiritual stalwarts who have upheld the doctrines of grace. In this book, the first in the five-volume A Long Line of Godly Men series, Dr. Steven J. Lawson takes you on a heart-stirring survey of the Scriptures to show that the Bible in its entirety teaches the doctrines of grace. In Pillars of Grace, Dr. Lawson walks readers through the ups and downs of church history, profiling these voices for the truth. The inescapable conclusion is that the doctrines of grace are no innovation, but the consistent witness of some of the greatest men of the?church.